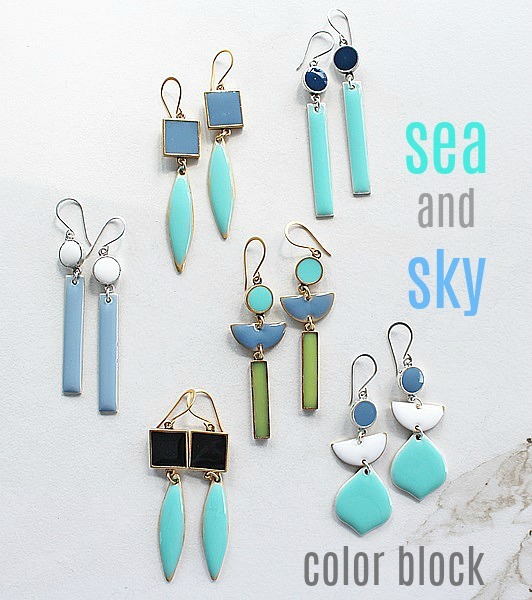 These darling earrings are made from hand poured colorized resin. Each piece is painstakingly made and cured by me. This set is the Sea and Sky. Choose your style from the drop down menu. Each pair is hung on either Sterling Silver or 14kt Gold Earwires and each vary in length. Small Round, long Bar in either Midnight Blue and Aqua or White and Sky- 3"
Midnight Blue Square and Aqua Drop or Sky Square and Aqua Drop - 2.75"
Aqua Arabesque with white half moon, small blue round - 2.75"
Small round, white half moon, and thin green bar - 2.75"